KUALA LUMPUR (Oct 17): The FBM KLCI rebounded today, rising 1.16% or 20.54 points to 1,788.31. This was a respite from yesterday’s close of 1,767.77, a 13-month low, but still below the ‘psychologically’ important level of 1,800. 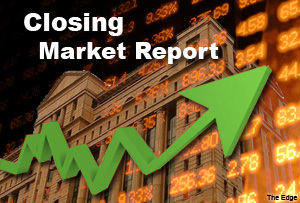 In the broader market, decliners outpaced gainers 884 to 126, while 161 counters remained unchanged. This compared with losers hammering gainers at 1,001 against 64 yesterday. Meanwhile, turnover today stood at 2.3 billion shares valued at RM2.48 billion. When contacted, Chan Ken Yew, head of research at Kenanga Investment Bank Bhd, said today’s technical rebound reflected the market’s oversold condition. “We have seen the temporary ‘bottom’. At [about] 1,770 points, this is close to a 9% discount to the long-term average of 1,945 points. The index should be at about a 6% discount, which means at levels of about 1,830 points,” Chan said over the phone. “We should probably see a reversion within the quarter. As for next week, we will probably see some consolidation… If we are lucky, we may even slowly consolidate back to the immediate psychological level of 1,800,” he added. Hong Leong Financial Group Bhd (HLFG) and Nestle (Malaysia) Bhd were top gainers today. HLFG rose 74 sen or 4.36% to RM17.72, while Nestle rose 56 sen or 0.85% to RM66.80. Inari Amerton Bhd (up 43 sen or 20.3%) and Globetronics Technology Bhd (up 40 sen or 10.61%) were also among the top gainers today. Meanwhile, top losers include Allianz Malaysia Bhd and Carlsberg Brewery Malaysia Bhd. Allianz lost 60 sen or 5.13% to RM11.10, while Carlsberg slipped 12 sen or 1.12% to RM10.58. Meanwhile, Sumatec Resources Bhd, Sanichi Technology Bhd and PDZ Holdings Bhd were among the most actively traded stocks on the local bourse. Sumatec saw some 116.9 million shares changed hands. Noteworthy is that oil and gas counters such as SapuraKencana Petroleum Bhd, Bumi Armada Bhd, and UMW Oil & Gas Corporation Bhd rose today, after trending downwards in the past weeks, as Brent crude oil price staged a rebound. Reuters earlier reported that Asian stocks, while defensive today, were unable to hold early gains as solid US data – published yesterday – gave only a temporary boost and was not enough to dispel underlying worries about slowing world economic growth. It said a possible recession in Europe, a floundering economy in Japan, a slowdown in China and the Ebola virus outbreak have conspired to rattle investors, triggering a level of volatility not seen in years. Nonetheless, the news agency cited the Volatility Index, viewed as a gauge of investor fears, eased to 25.2% from a 2 1/2 year high above 31% on Wednesday. “I expect market volatility to gradually come down. Loss-cutting trades will come to an end soon after a hectic week and markets will be looking to what kind of policy options major countries can adopt now,” Makoto Noji, senior strategist at SMBC Nikko Securities told Reuters. Across the region, Japan’s Nikkei 225 was down 1.40% to 14,532.51, South Korea’s Kospi slipped 0.95% to 1,900.66, Taiwan’s Taiex fell 1.4% to 8,512.88. Meanwhile, Hong Kong’s Hang Seng Index was up 0.53% to 23,023.21, Singapore’s Straits Times Index up 0.43% to 3,167.73. The ringgit, against the USD, continued to weaken to RM3.274, from RM3.2438 on Oct 9.